Giving gifts can be a stressful process, as most of us do not know how to shop for the people we care about most and it can be hard to choose a gift that the person does not already own. For these reasons and many others, the majority of us will often avoid the gift shopping process. But what if you were to learn about a great gift idea that would showcase your thoughtfulness? On a personal level, a gift such as this shows the person just how much you care and makes your gift certificate stand out as opposed to something that is more generic. The next time you find yourself stuck when it comes to the proper gift card, don’t be afraid to give a gift like never received before. 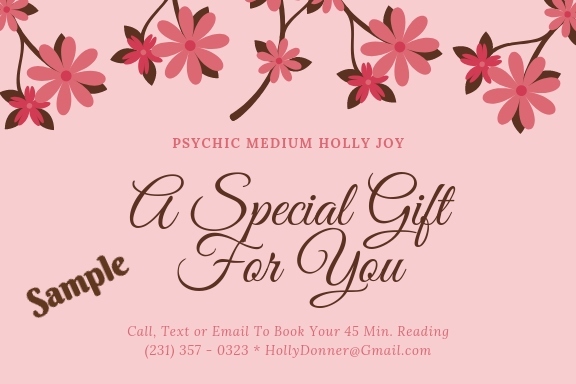 The recipient will appreciate the time and effort you put into this experience and not only reap the benefits of their Psychic Reading in the present and future but remember it as well. Simply contact me and I’ll send you an Invoice and Email you a printable Gift Certificate.